Welcome to Phases of the Moonblossom! I'm a fine & decorative artist, painter, and sign maker. 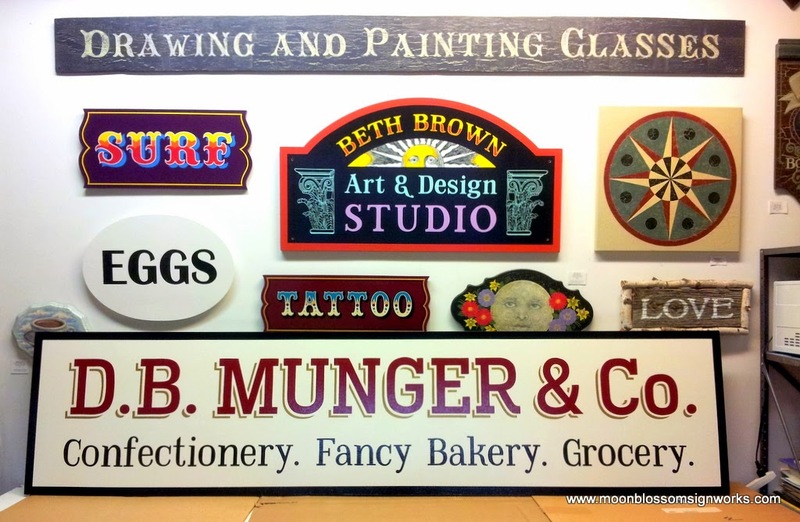 Beth Brown Art & Design Studio and Moonblossom Signworks & Art Company are my businesses. I'm owner and director of The Shoe Factory Art Co-op art gallery in Rochester, NY. 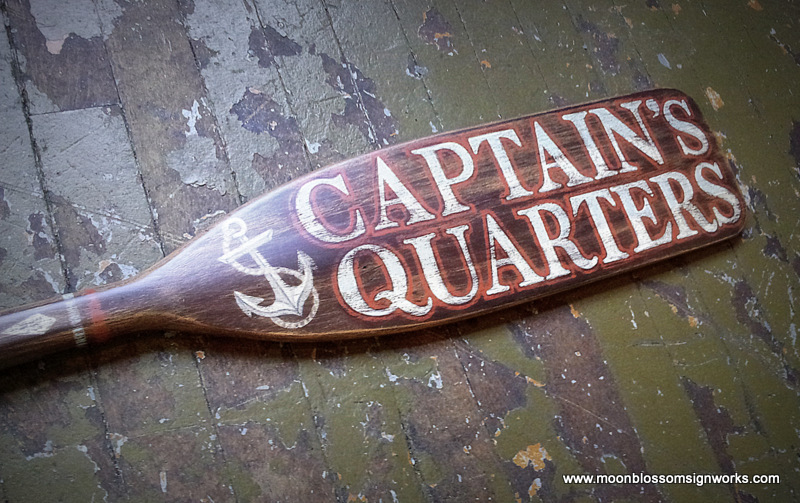 Got a custom order for a vintage style hand painted wooden oar. 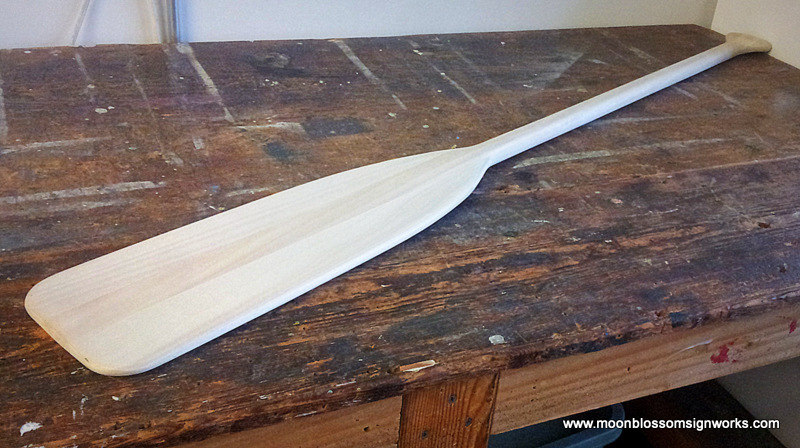 With no used paddles to be found, a brand new 52" one was purchased, unfinished. I painted a dark brown faux finish to make the oar look old. At the customer's request, the words "Captain's Quarters" were hand lettered, accompanied by the embellishment of an anchor. 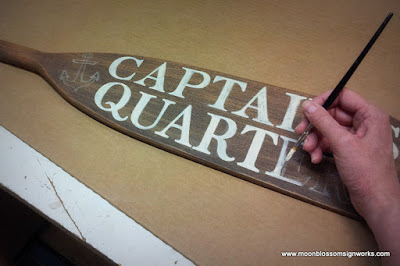 The client's name was painted on the handle (not pictured here). After a little sanding to make the letters appear weathered, a protective coat of polyurethane finished the piece. I'm happy to have contributed my sign making skills to the Genesee Country Village & Museum. Over 40 restored and furnished 19th century buildings can be explored on museum grounds in the hamlet of Mumford, NY. 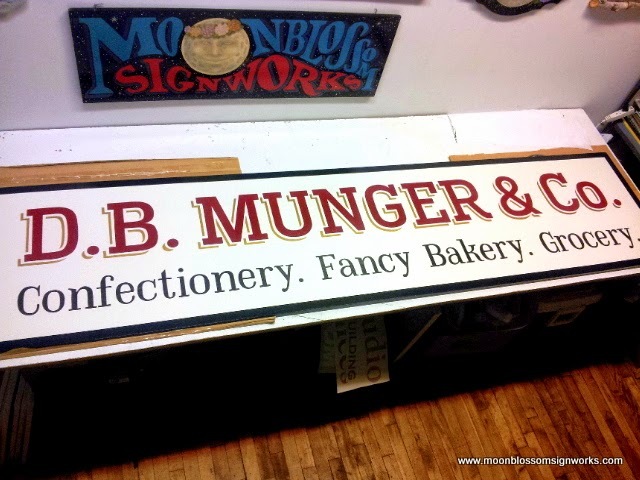 I created this hand painted sign last spring for the June opening of the museum's new confectionery, D. B. Munger & Co. 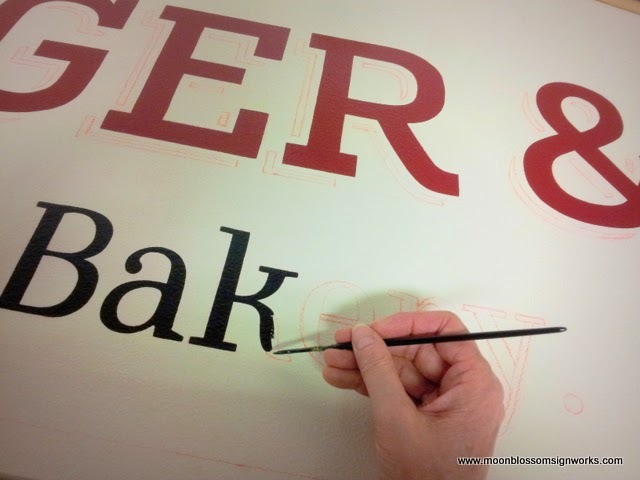 I make signs in my art studio in Rochester, New York, 20 miles from the museum. At the confectionery, visitors with an old fashioned sweet tooth can taste what tarts, buns, cakes, pies, and cookies tasted like in the 1800's! My Dad requested that I do an art project for him. 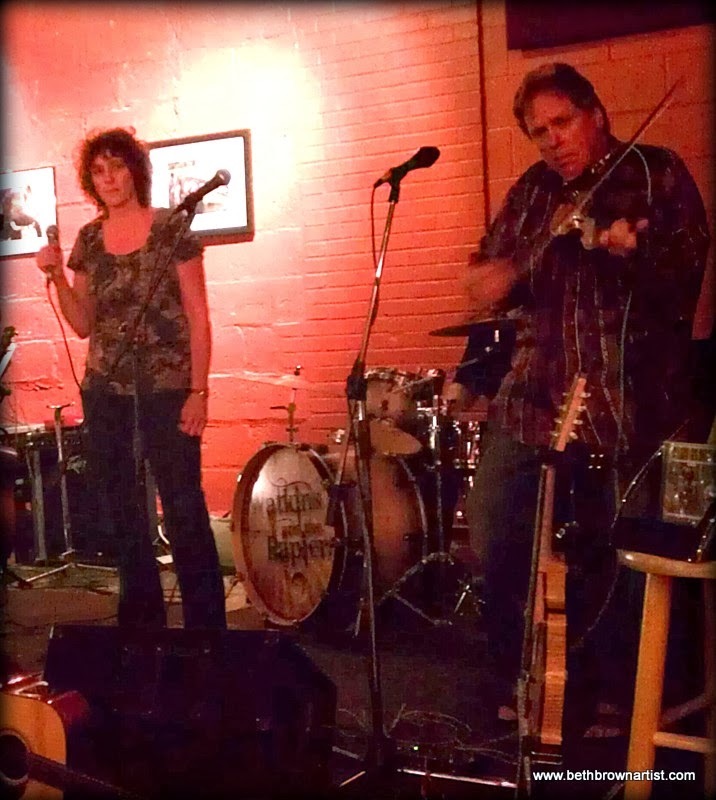 He's a retired physician turned musician and plays stand up bass for WildRoot String Band. He also plays fiddle and banjo. 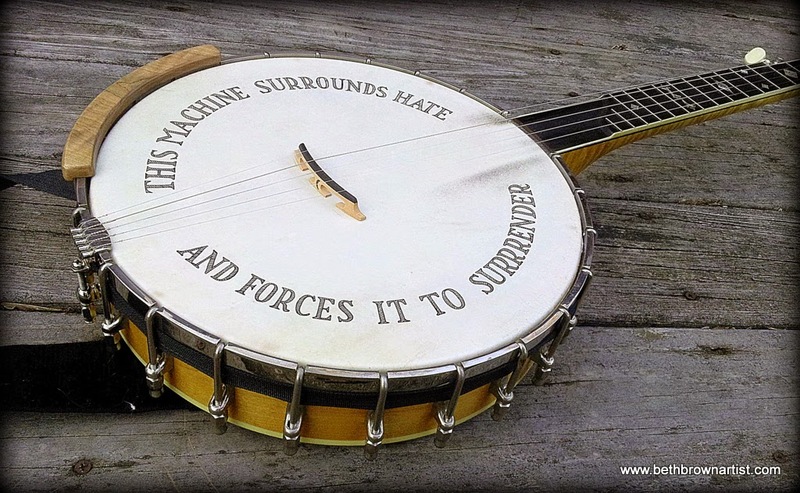 He asked me to draw the words "This Machine Surrounds Hate and Forces It to Surrender" on his banjo in tribute to musician/activist Pete Seeger who passed away this year. 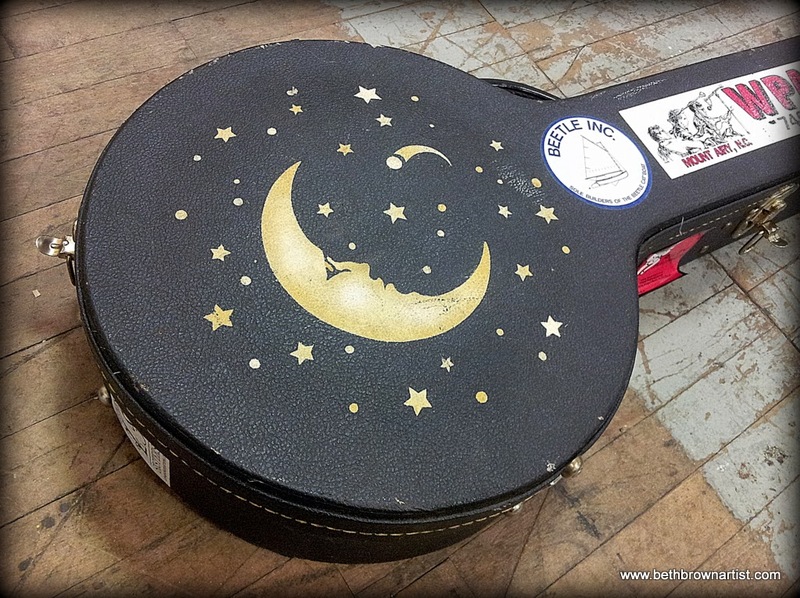 My previous artistic contribution to my Dad's banjo was to paint a crescent moon and stars on his case a number of years back. 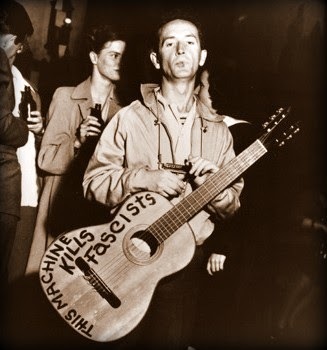 Being an artist for hire, and an admirer of Pete Seeger, I readily agreed! In preparation for my task, I searched for images of Pete's banjo. 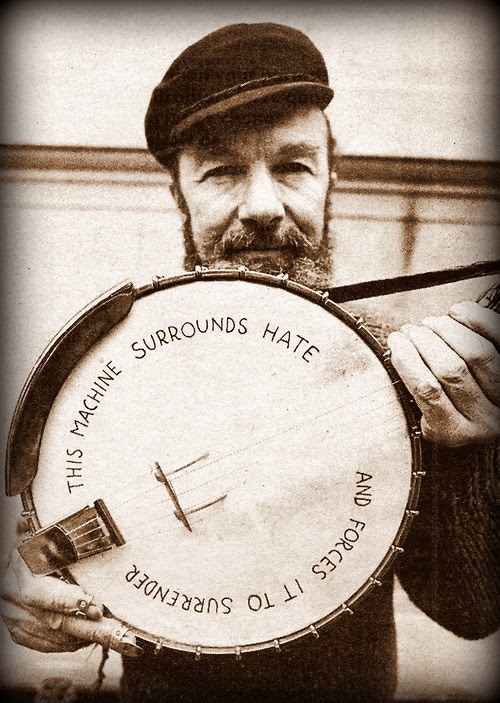 I discovered that Pete had written his message on not just one, but many of his banjos. They all had different visual appeal. 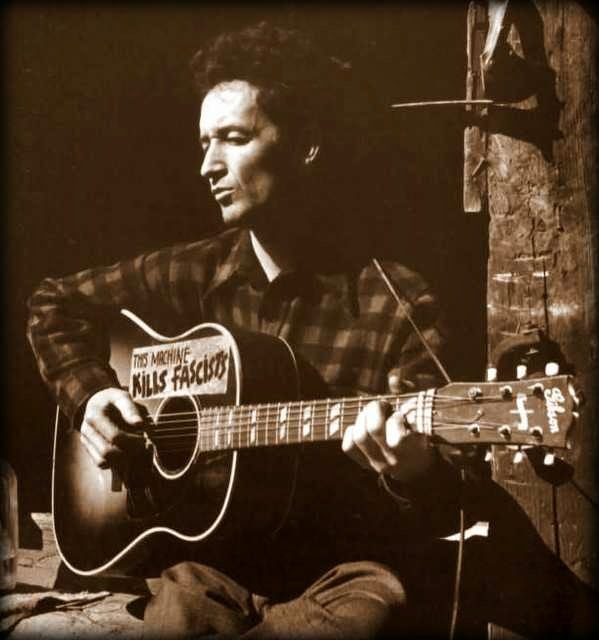 I also learned that Seeger's inspiration for banjo graffiti came from his friend and music associate, Woody Guthrie. 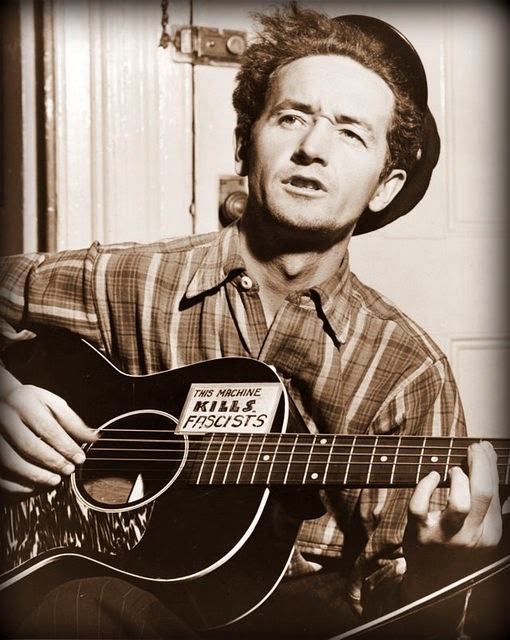 Guthrie had set a precedent by inscribing "This Machine Kills Fascists" on many of his guitars. 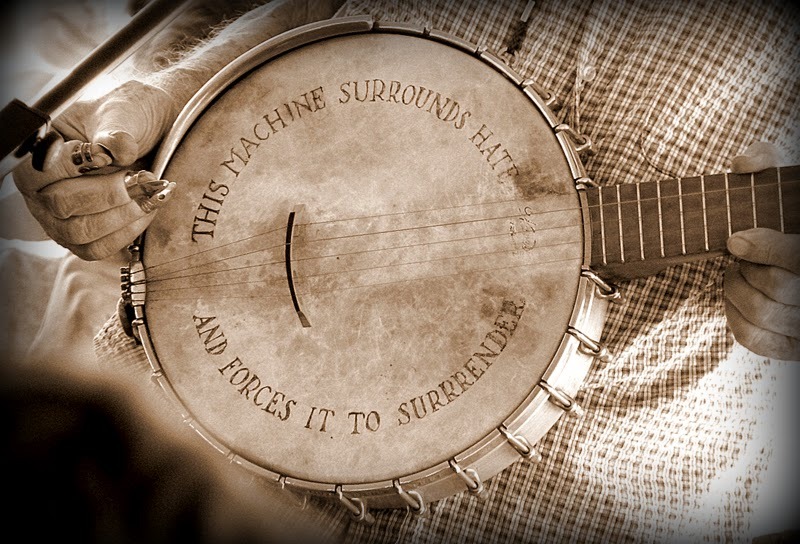 I selected the Seeger banjo image I liked best and proceeded to write Pete's peaceful proclamation in similar fashion on my Dad's banjo. 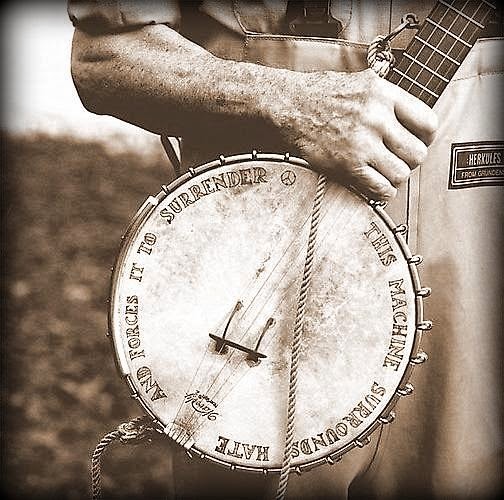 While working on it, I noticed that Seeger's banjo has a misspelling. 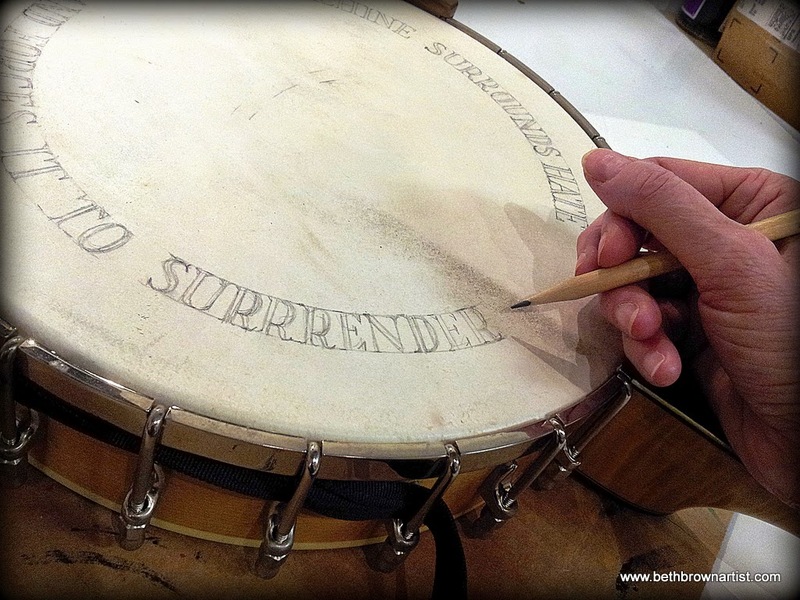 SURRENDER is spelled SURRRENDER with an extra R. I wondered if this was intentional, but upon scrutinizing the other banjo photos I could see that they were spelled correctly. Pete must have just goofed this one when he wrote it. It was exciting to discover this oddity so I didn't fix it. 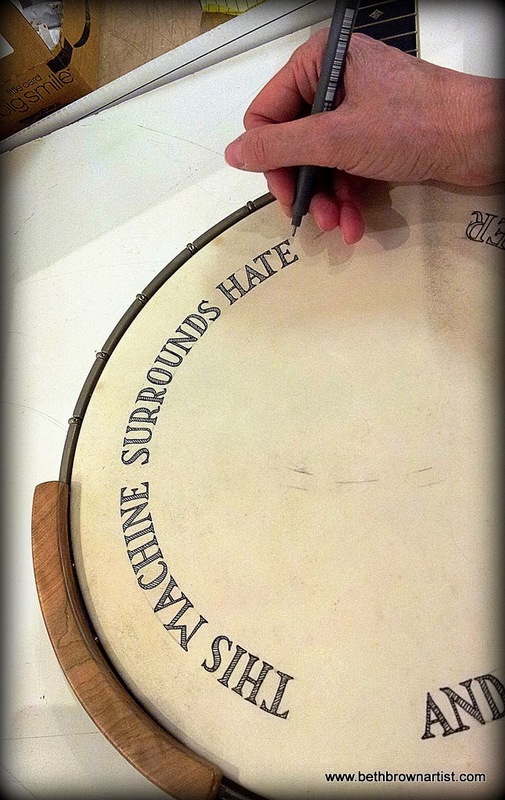 After rendering the quote in pencil on the banjo head, I finished it with black fine-point marker. Strings back in place. 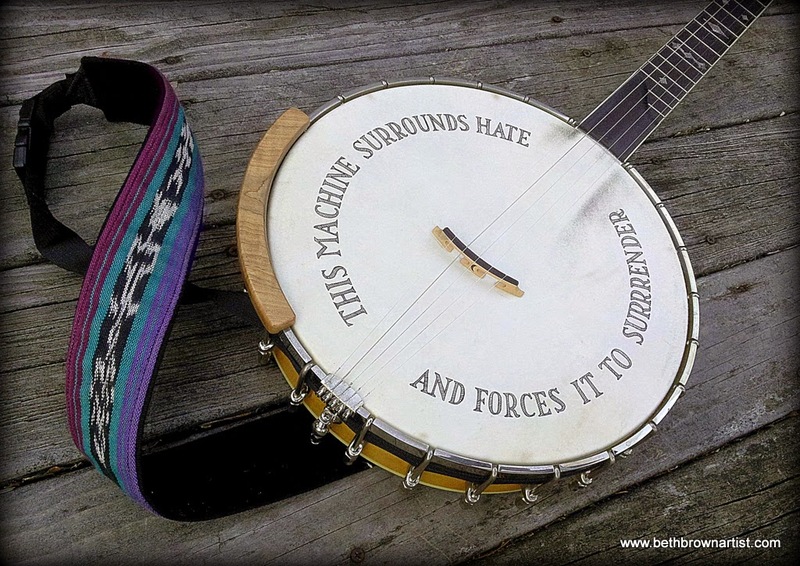 Pete's message lives on through another banjo! 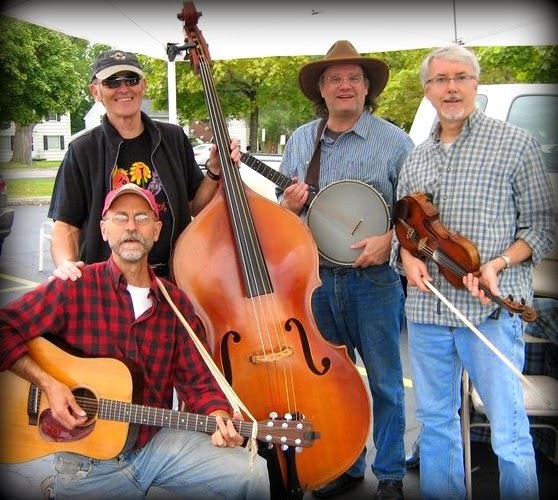 Here's my Dad with his upright bass in WildRoot String Band. 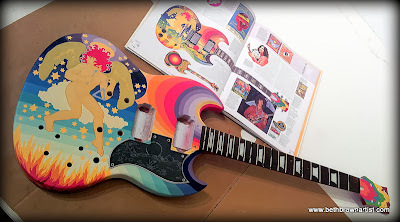 Sorry I took so long to post these last photos of my Fool guitar painting project! No excuses for a lazy blogger. 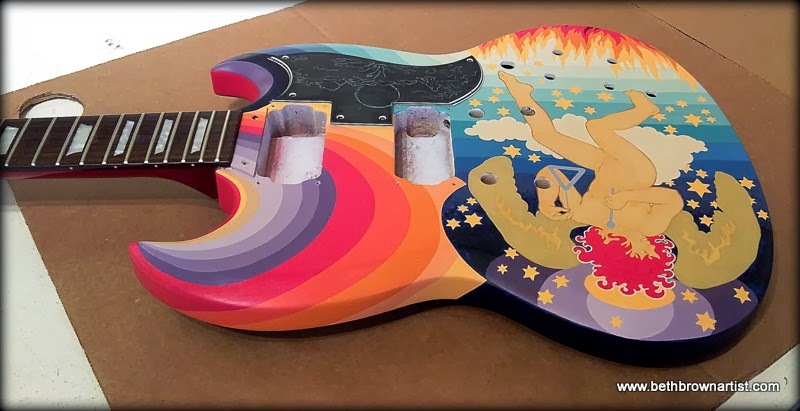 Bruce Diamond had commissioned me to paint a copy (front only) of this famous psychedelic-1960's-Clapton-Cream-dream guitar. When I finished the complex painting in my studio (see previous posts) and applied one protective coating on the guitar, Bruce took it home and spray coated the final clear finishes. He brought it back with the pickups, hardware, and strings installed so I could take pictures. 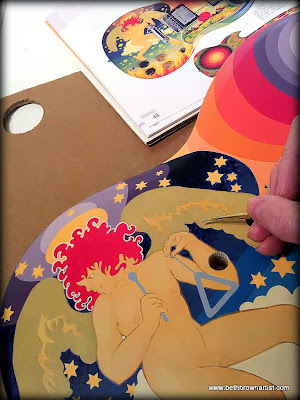 This not-for-the-faint-of-heart task was an enjoyable journey for me through art and music history. Now Bruce's son Luke gets to play the Fool. 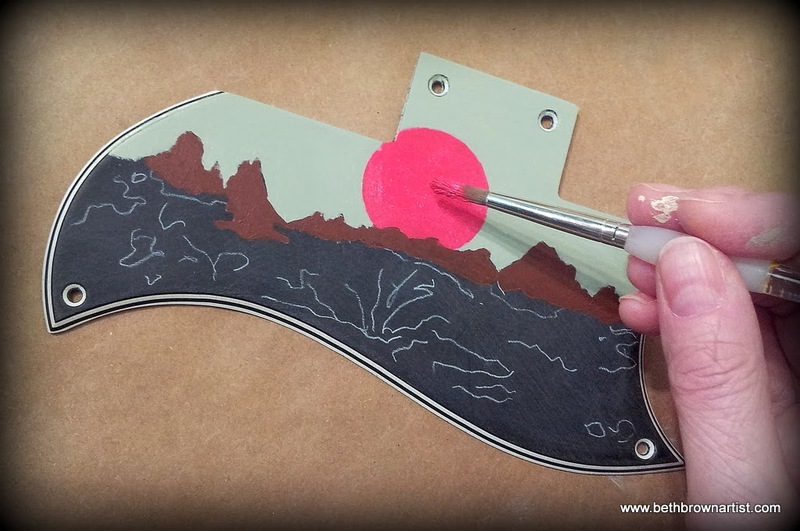 How did this art project come about? 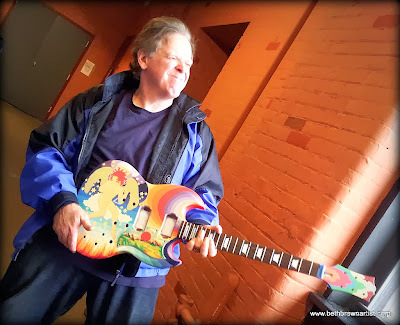 Bruce Diamond and I met playing around town together in various bands. Bruce is not only a versatile musician, but he also makes a living as an instrument dealer for his business Diamond Strings. He discovered I was an artist. 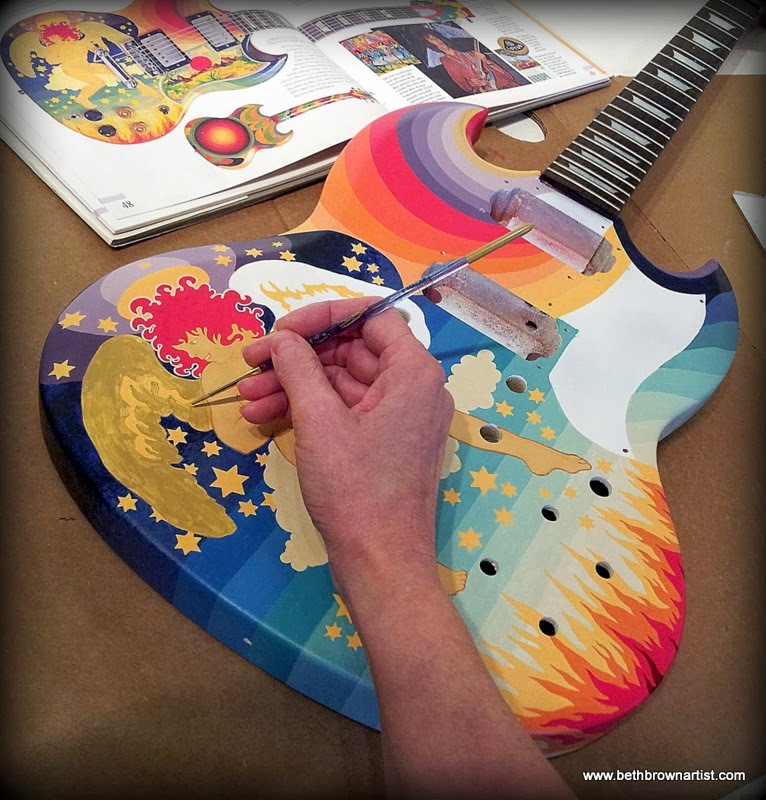 I mentioned to him that I could paint artwork on guitars. He said he had the perfect project for me and asked if I would be interested in painting a replica of Eric Clapton's famous Cream Fool SG, circa 1967. How could I refuse such an interesting and challenging commission? It was right up my alley artistically and musically. So that's how it all started, folks! 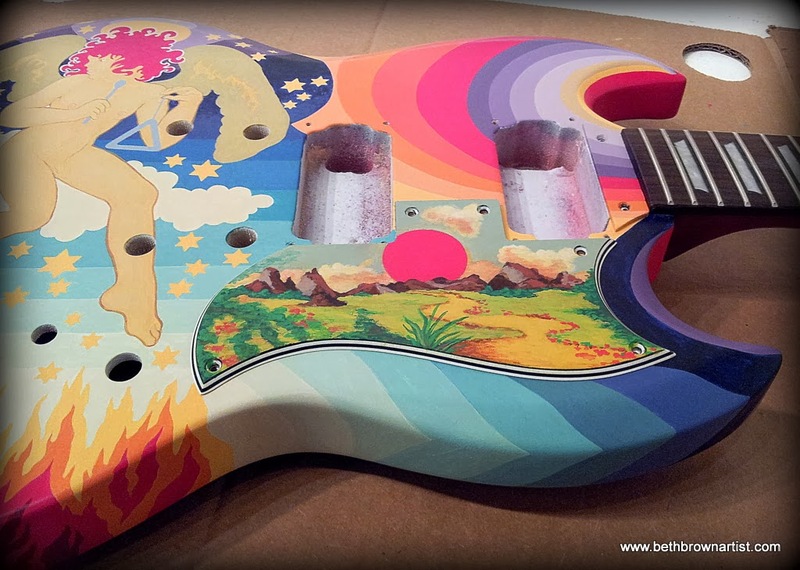 Now that the painted psychedelic artwork on the guitar is finished, I'll feel better if I put a clearcoat on it before it leaves my studio. Don't want any accidental scratches on all the hard work I've done!!! Bruce will apply more coats to further protect it when he gets the guitar home. 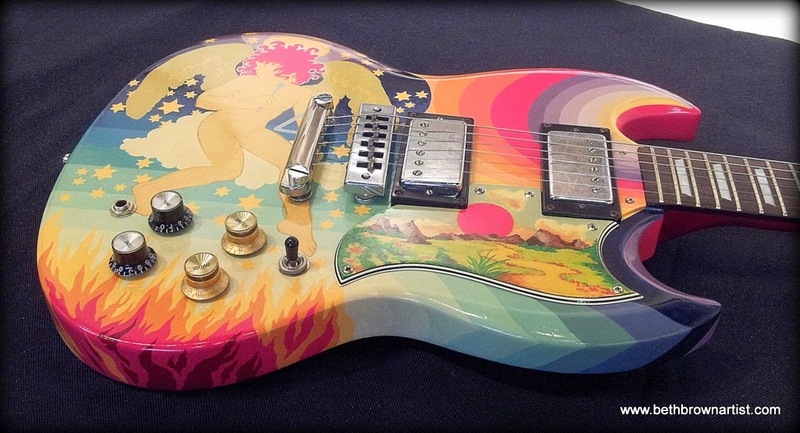 I'll start with the pickguard. I'm brushing it on rather than spraying it. I do not like to breathe fine spray vapor, thanks very much. I'm using a product I'm familiar with, Zar fast-drying polyurethane Clear Antique Flat. 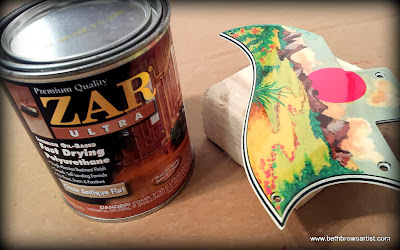 I've used it before on many other painting projects. It has a slight yellow tint to it. 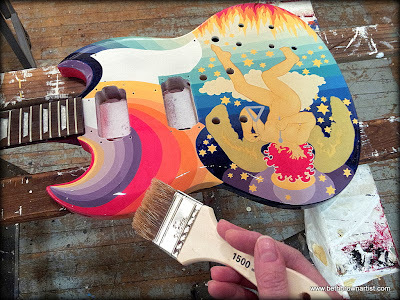 This will help to make the guitar appear a bit yellow with age. I've carefully taped blue painter's tape around the headstock and under the guitar body to prevent the polyurethane from dripping over the edges of the painted artwork. 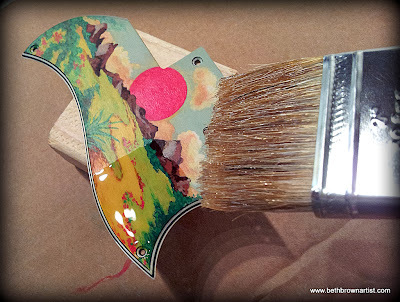 The tape can be peeled off after the poly dries for a nice clean edge. 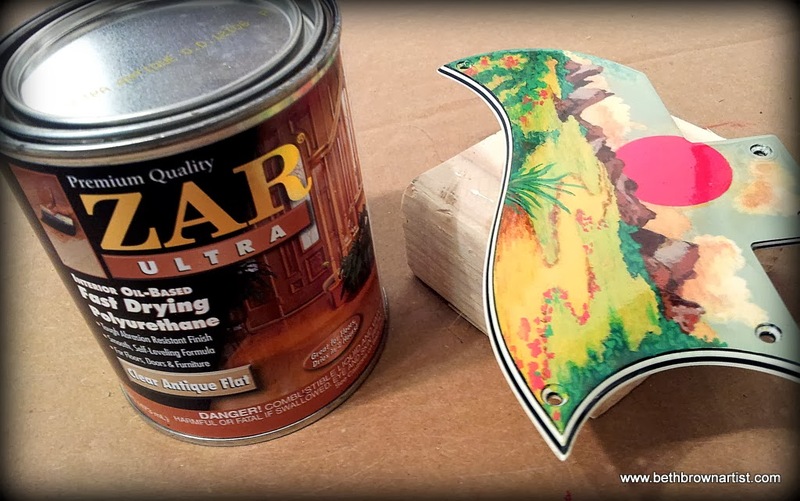 The flat polyurethane may look glossy when it goes on, but when it dries it will not have much of a sheen. Bruce will apply a heavy duty gloss finish later on. 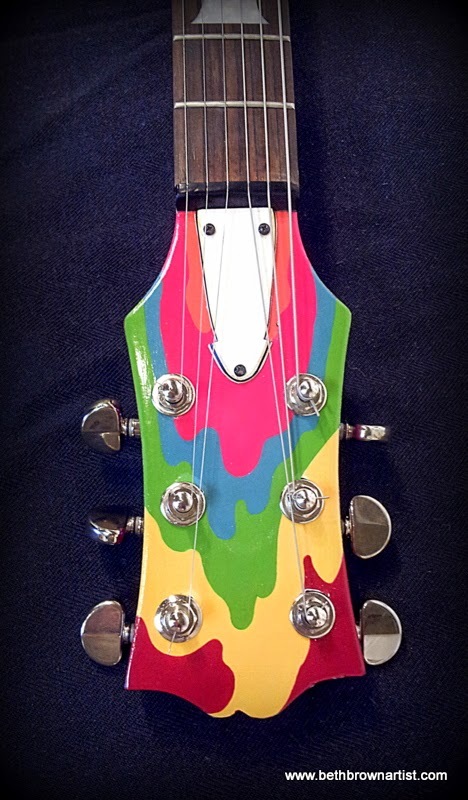 Okay, the guitar has dried overnight. 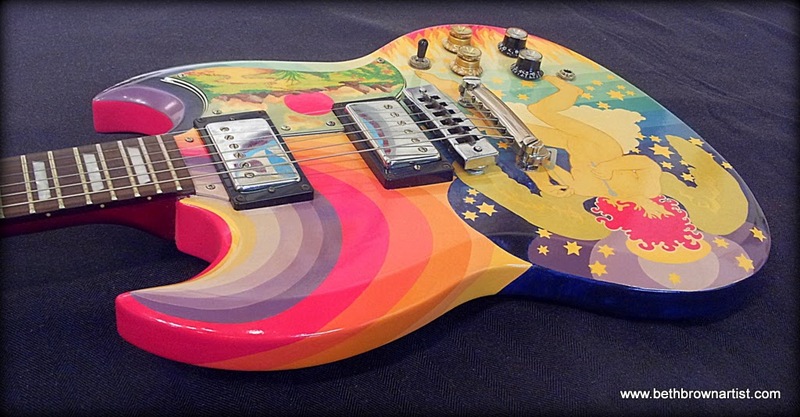 I contacted Bruce to come and pick up his guitar. Here he is pictured with the finished product! 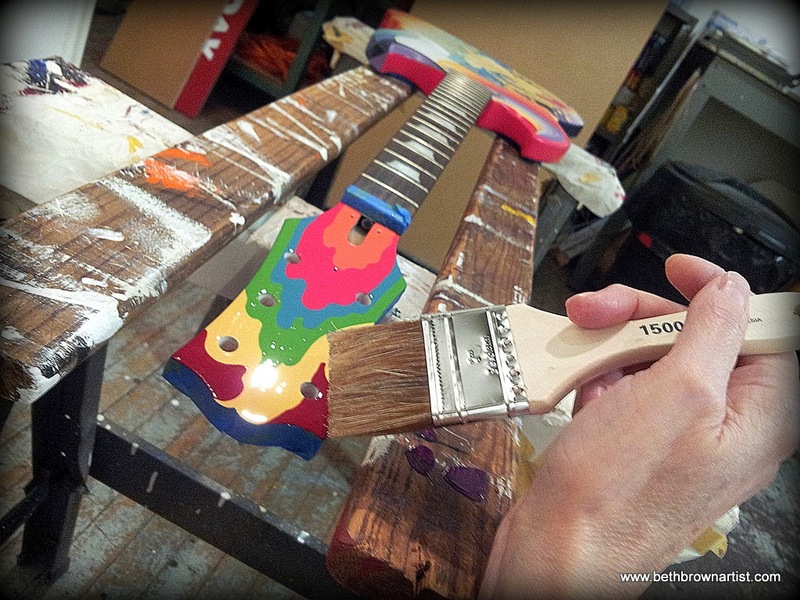 He will take it home and spray numerous coats of gloss polyurethane on it, then attach the hardware, strings, etc. I hope he will bring it back so I can get more photos of the completed piece. 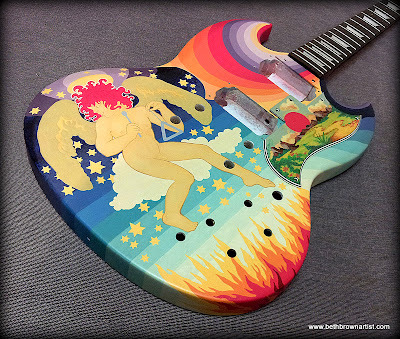 I am so glad to have played a starring role in Bruce Diamond's long awaited Fool Guitar dream-come-true!!! It's been an arduous journey, but a great learning experience and an artistic notch in my belt. Okay, okay! I've procrastinated long enough! The intimidation of the pickguard got the best of me! I finally mustered up the courage to finish the job. 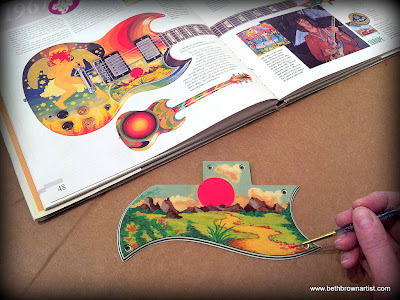 Onward, to completing a replica of Eric Clapton's Fool guitar! 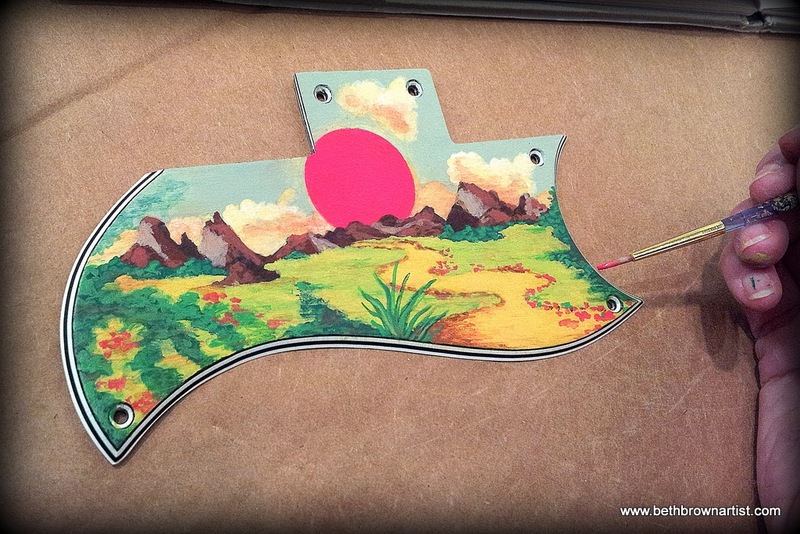 I painted the pickguard in three sittings. Started with the cosmic red sun, greyish blue sky, and mountains. Broke the ice!!! 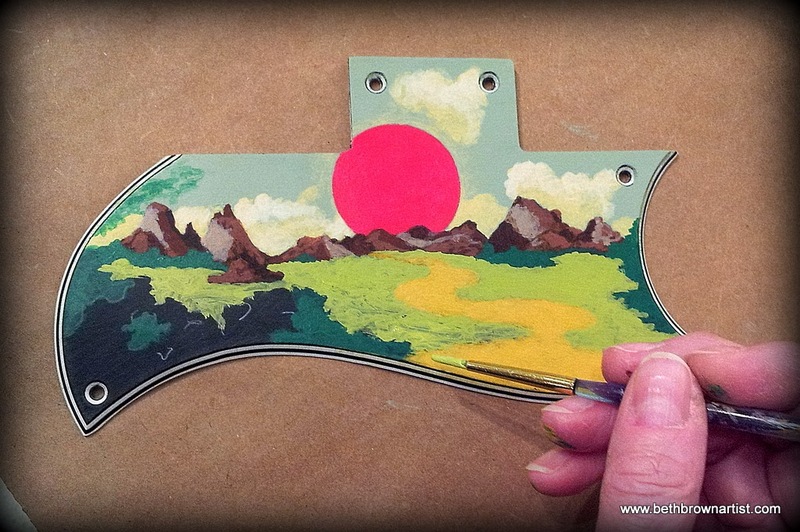 Next, added the clouds, golden path, green grass and foliage. Finished with the little details, all the while using my photo reference from the book Classic Guitars of the 60s edited by Tony Bacon. 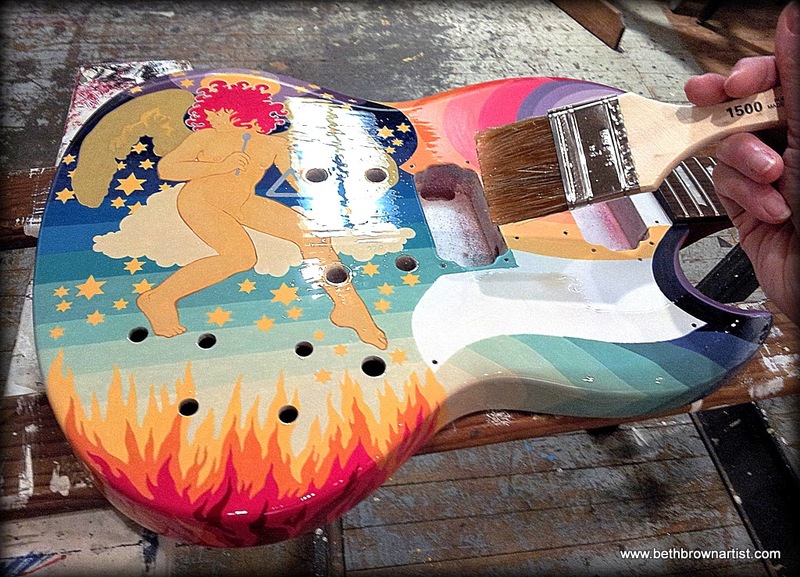 Next I will apply a protective clear coat before the guitar leaves my studio. My client Bruce Diamond can apply subsequent coats for further protection. 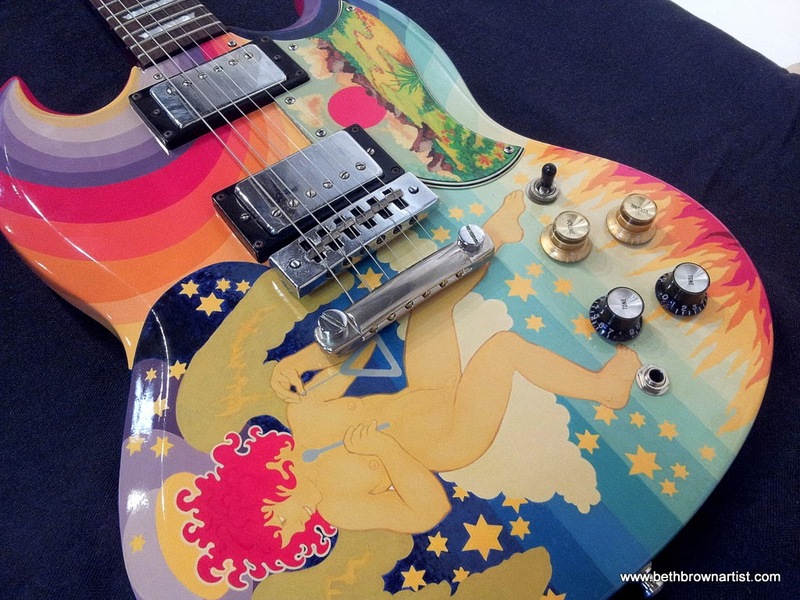 I can't wait to see it when Bruce attaches all the hardware and strings! Hopefully I can post photos of how that will look. Stay tuned!!! Hi, Folks! It's been awhile! 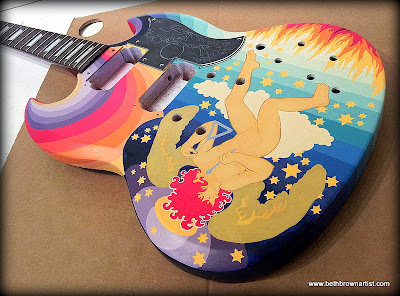 Getting back to posting photos of my artistic interpretation of Eric Clapton's "Fool" guitar! 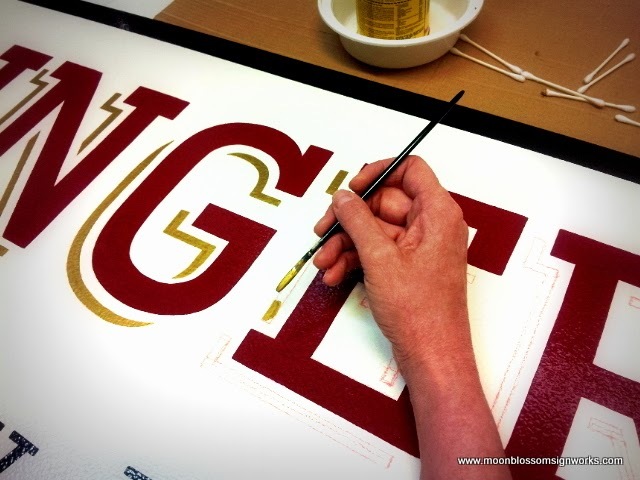 Now for the angel wings! 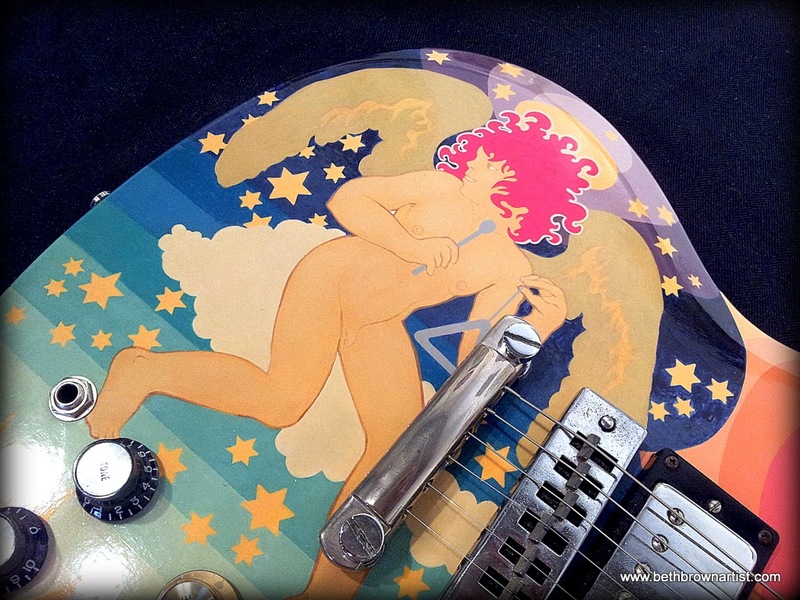 The wings have a strange tannish-gold color in the pictures I've seen of the guitar. I wondered if the wings were metallic gold since gold can be difficult to photograph and will often look a dull brown in a photo. My good friend and ex-bandmate, Pat Thomas, is a writer, musician, and music historian. 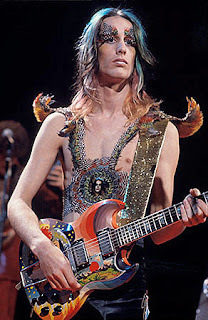 He happens to know Bobby Whitlock and said he would ask him for me about the color of the wings. 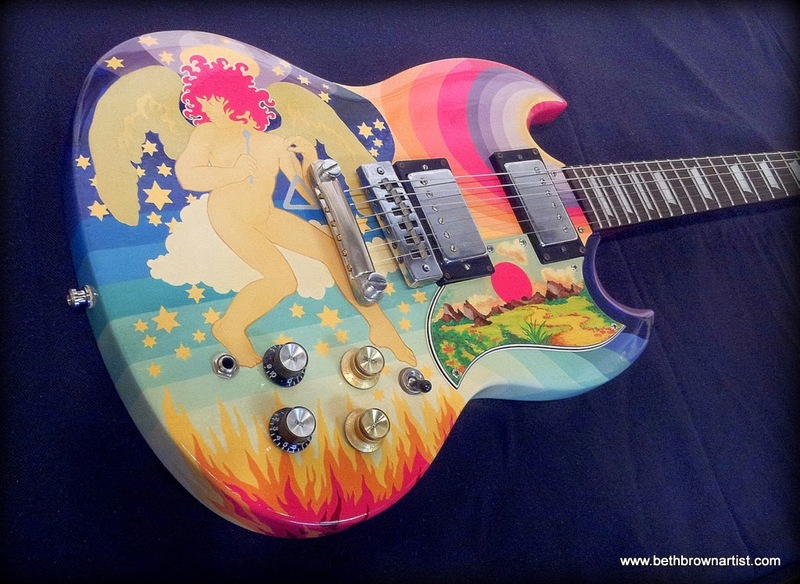 Bobby Whitlock played the guitar many times back in the day when he collaborated with Eric Clapton on various musical projects, including Derek and the Dominos. 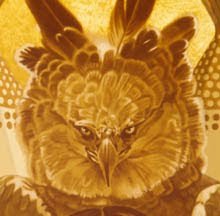 Whitlock responded, "I don't remember them as gold but yellow and a dull one at that...Just reflecting back on it and I am probably closer to right than not...There was no outstanding glossy metal look about it at all...All of the colors blended together and nothing like bright gold wings was there to my rememberence." Nuff said! I will keep trying to match colors from the reference photos I'm using as best I can. I am mostly using a photo from a book that Bruce Diamond let me borrow, Classic Guitars of the 60s, edited by Tony Bacon. I've also found a few halfway decent images of the original guitar on the internet. 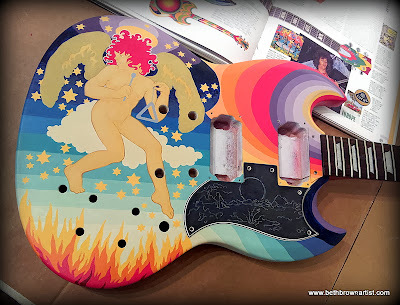 In any case, I don't know whether my painting will be truly historically accurate because at some point Todd Rundgren owned the guitar and had it refinished after it was left in sorry condition from many years of Clapton's vigorous use of it. I'm not sure when the photo in the book Classic Guitars of the 60s was taken, before or after the guitar was refinished. 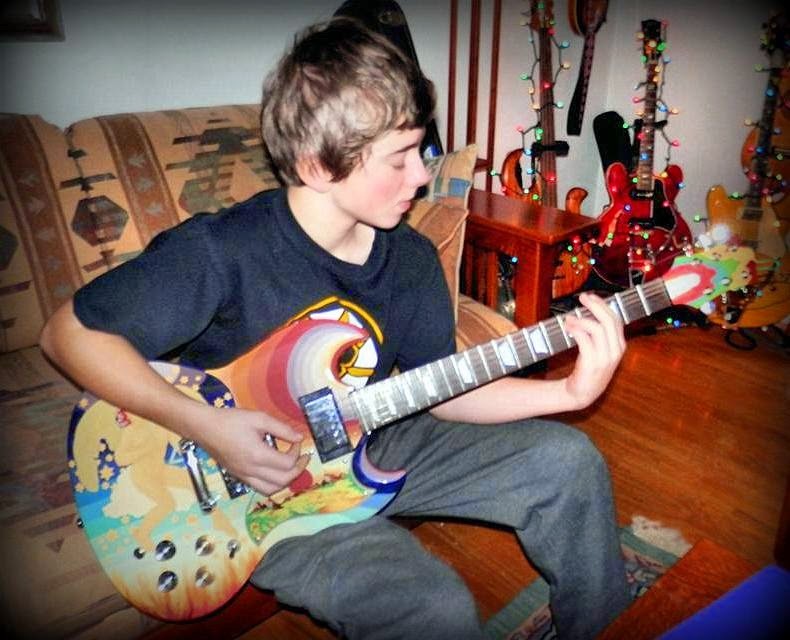 I don't know how the guitar's paint job may have changed. Oh, well. Historic accuracy aside, I'm enjoying the process in my attempt to recreate this artistic gem from the psychedelic era, originally painted by Marijke Koger and Simon Posthuma. 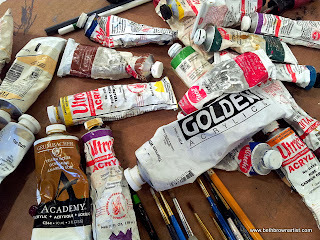 People are asking me what paints I'm using. Just a variety of acrylic paints from the tube. Onward to the little masterpiece on the pickguard! I need to finish this project! Some of my signs and artwork can be purchased on Etsy! Custom orders welcome. 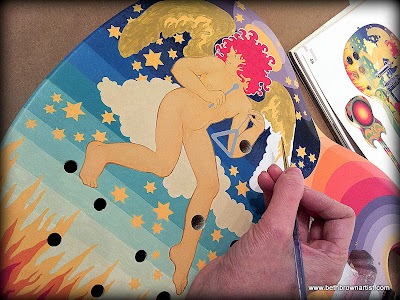 Fine and decorative artist specializing in paintings, portraits, murals, signs, illustration, and graphic design.